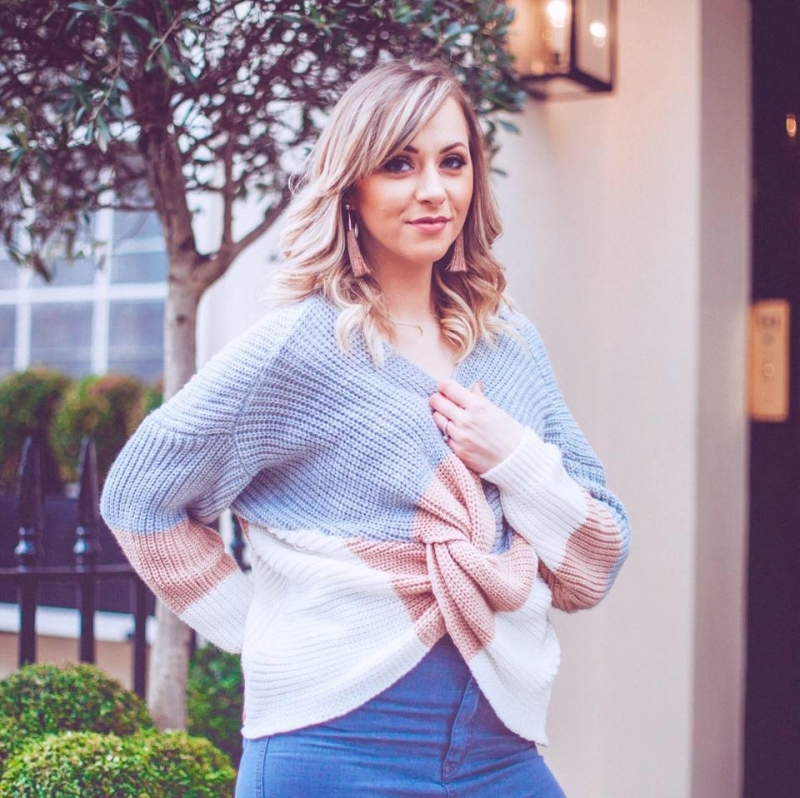 That’s exactly what happened when my trademark perfume – my favourite scent and the smell all my friends and family associate with me – when my trademark perfume introduced a candle to their collection… A CANDLE. Sweet heavens, the answers to my prayers. 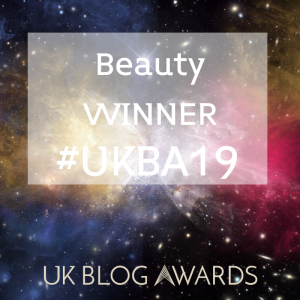 In fact, so unique is the Thierry Mugler Alien perfume, that I’d never even imagined a candle could be in the pipeline…until it landed on my doorstep and made me one seriously happy lady. Alien had been my perfume of choice for years, in fact I can’t remember how many exactly. 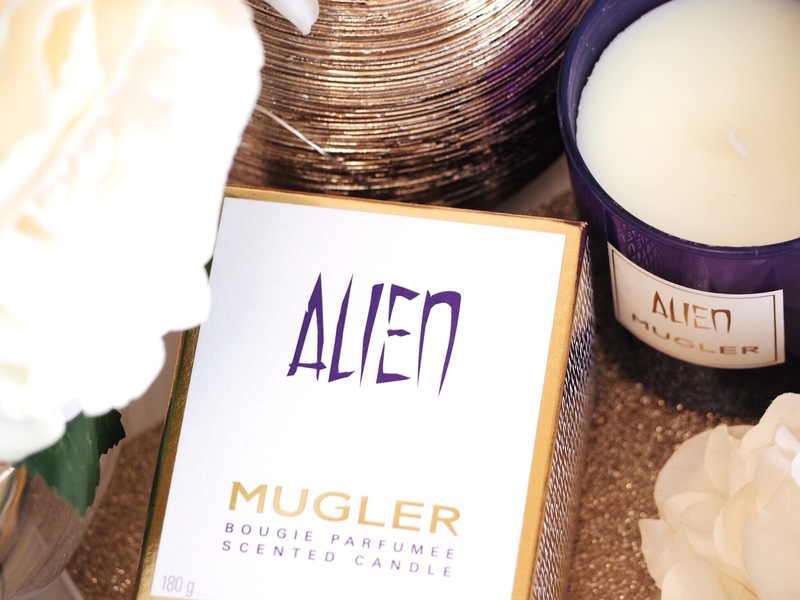 I try others, I love others (I reviewed Angel Muse, the latest scent from Thierry Mugler here recently) but Alien will always be my trademark. It’s a scent like no other – it’s beautiful and heady, it’s sultry and romantic and completely different to any other perfume out there. Even now, years down the line, nothing compares. It’s rich floral notes, with a balance of jasmine means it creates a feminine scent combined with a masculine musk and the result is something that I love to wear whatever season we’re in. 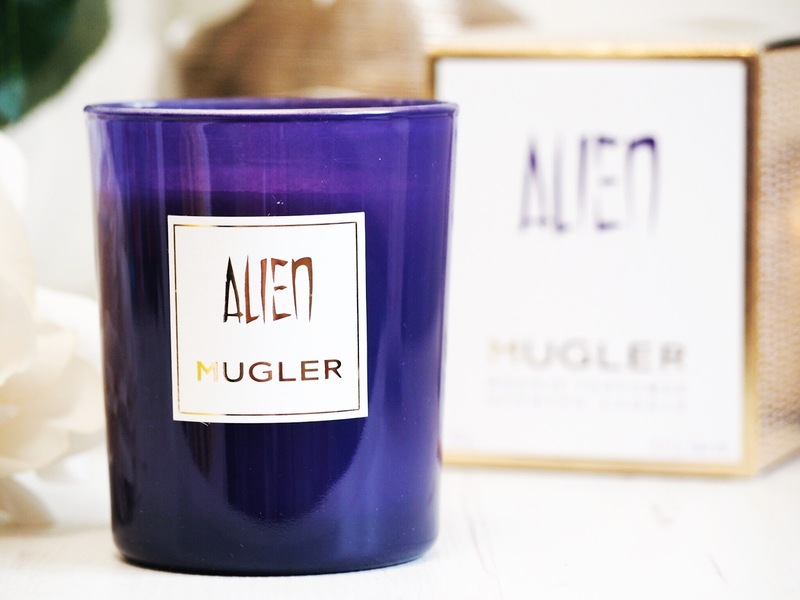 Being a scented candle addict too, the Alien Candle has been amazing to have. It’s probably my favourite candle this year. In fact, it’s definitely my favourite candle this year. Perfectly matching the design of the perfume, the creamy white candle is housed in a dark and gorgeous purple glass canister. 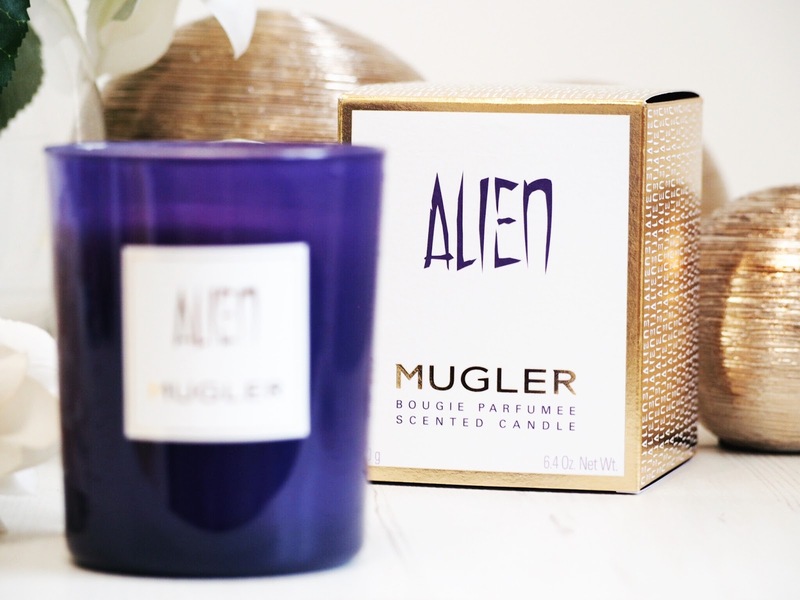 So strong is the scent that you can smell it through the box, which assured me even before I burnt it, that it’s strength would match that of the Mugler perfumes. As we’ve finally hit autumn, it’s properly scented candle time. I’m not one who doesn’t have candles burning all year round, but yes, I have significantly less burning during the summer. Because quite honestly, my house is like a furnance in the summer and so I try to avoid adding any more heat to the mix. But now it’s cooling down I’ve got my candles on as soon as I get home from work. And the Alien candle has taken pride of place above all others in my collection since it arrived. It’s warm and sensual. The strength is powerful and unmissable, and this emerging trend of creating candles to match perfumes is something I am besotted with. The Alien Candle has a burn time of 40 hours, and I’m approximately 2/3 of the way through mine. It’s £39, so quite pricey for a candle but the scent lingers even after distinguishing the flame, to the point I can still sense traces of it in the air the next day. So it’s quality and affect is long lasting and therefore justifiable. However, even at £39 I’d still re-buy this because quite honestly, it’s my favourite perfume and I’d want it in every variety and form possible. 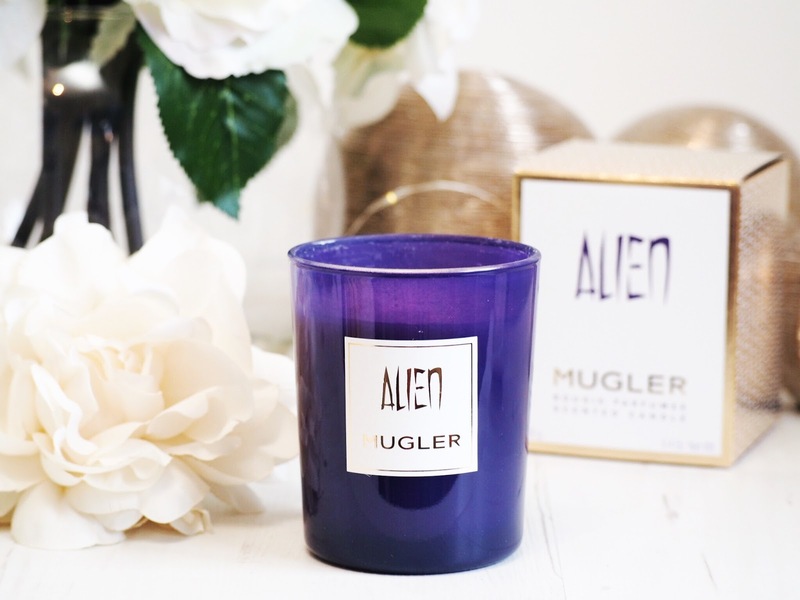 So if you’re a fan of the Mugler scents, the candles are a must-have for wish-lists this Christmas. Not only can you get Alien, but there’s an Angel version as well. So, the question is: will you be putting one of the Alien or Angel candles on your Christmas list this year?